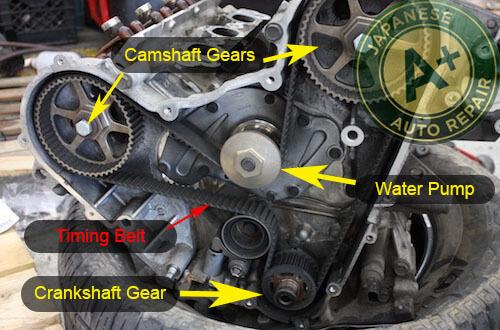 San Carlos Timing Belt Repair & Service - A+ Japanese Auto Repair, Inc.
A+ Japanese Auto Repair Inc employs expertly trained timing belt repair & service technicians. If you are due for your 90, 105, or 120K timing belt interval service, contact our staff 650-946-1856, book an appointment, or stop by today. We look forward to working with you. Why do I need to change a timing belt? All vehicles with an internal combustion engine, meaning most engine types besides electric, are equipped with a timing belt. The purpose of this belt is to time the engine so valves, pistons and other internal parts move in unison. We see one of the more common failures starting to occur. The timing belt has cracks on the other side, as well. These cracks in the timing belt usually occur where the teeth extend from the timing belt. The teeth on a vehicles timing belt have been known to shred off the belt at these cracks causing serious damage to the motor. When a timing belt breaks it can cause internal engine damage to the valves and pistons. To access the valve and piston the engine had to be removed and separated. A broken belt will typically bend valves and in some cases even drive a valve through the piston. Don't let a broken timing belt happen to you. A timing belt is typically rubber with high strength fibers running through the timing belt. Usually, these timing belt fibers are Kevlar. On some of the belts we have also seen fiberglass used as the timing belt fibers. The timing belt is typically grooved with Cogs that fit in between the cogs on the gears. This allows for perfect timing of the motor insuring the valves and the pistons do not collide causing internal engine damage. The engine is timed using special markings on the gears when installing a new timing belt. 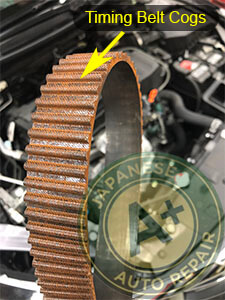 It is important you have your timing belt changed by an expert such as A+ Japanese Auto Repair Inc. in San Carlos. Because the timing belt is mainly composed of rubber it wears out. Rubber degrades with higher temperatures, and with contact to engine oil and other petroleum products. So, keep in mind the life expectancy of a timing belt is lowered in vehicles that run hot or have engine oil leaks in the timing cavity. Newer or more expensive belts are made of temperature resistant materials such as "highly saturated nitrile". 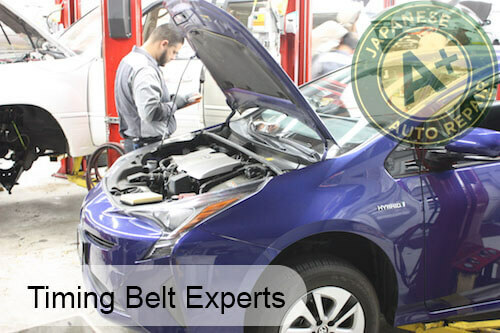 These types of belts are becoming more available and A+ Japanese Auto Repair makes sure to give you all options when it comes to replacement of your timing belt. How long should a timing belt last? Timing belts usually last 6-10 years or 60,000 to 105,000 miles. How long the timing belt will last depends on how the vehicle is driven, what temperatures the rubber timing belt is exposed to, and the quality of the timing belt. Make sure to check with A+ Japanese Auto Repair to determine when your timing belt should be replaced, 650-946-1856. Depending on the vehicle, you will need to replace the timing belt between 60,000 and 105,000 miles. The vehicle manufacture sets the rules about how often the timing belt should be replaced so make sure to check your owner's manual to confirm for your specific vehicle. How much should it cost to replace a timing belt? A timing belt "package" will cost between $700 and $1200. The cost of timing belt job depends on the location of the shop, the type of vehicle, and what components you change while changing the timing belt. A+ Japanese Auto Repair recommends to replace all of the moving components under the timing belt cover when we are working timing belt. We have seen that we typically save our client's money by changing these components all at once vs. doing the job again later when another timing belt component fails. What happens when the timing belt goes bad? Failure to replace a worn timing belt can result in a stranded vehicle or, worse, a damaged engine. When a timing belt goes bad, it will usually break or slip. Don't let a broken timing belt happen to your car.